Think outside of the box with this collection of delicious pear recipes. Whether you've got a tree in the backyard or pick them up at a farmstand, you can use pears for virtually every meal. Here are a few of our favorite ways to prepare them. 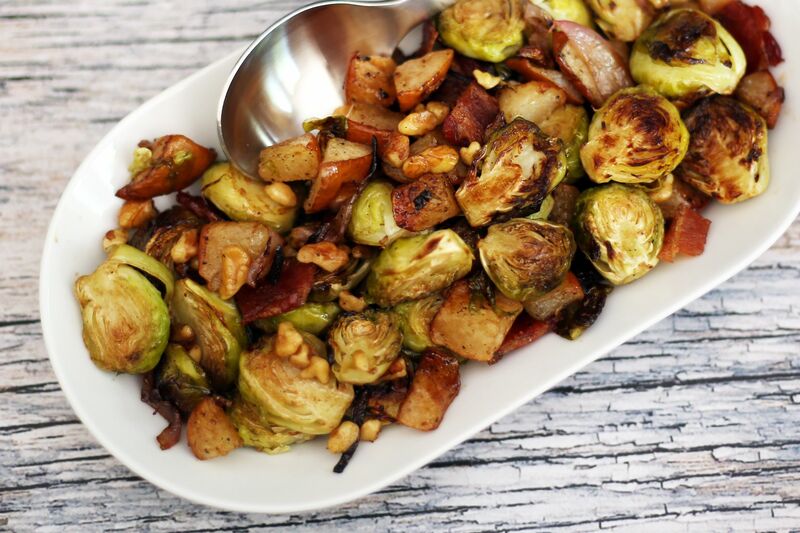 Roasting Brussels sprouts brings out their natural sweetness, giving them a caramelized flavor and slightly crispy edges. Combine those with pears, crunchy walnuts, and savory bacon and you've got a vegetable side dish that might just steal the show. Pecans or hazelnuts would work well in place of the pecans, and you can substitute pancetta for the bacon for an even fancier presentation. If you're firing up the grill, don't forget dessert! All varieties of pears work wonderfully when charred, which brings out their natural sweetness. Add a sprinkle of cinnamon, cardamom, garam masala, or even a little cayenne for extra spice. Serve these by themselves or with a little ice cream or chocolate sauce for a light, easy end to an al fresco meal. Try this Moroccan-inspired kosher stew for Passover or another holiday meal. It can be made two days ahead to give the flavors a chance to meld and take some work off your plate on the big day. The relatively simple stew is deep and rich, with the pears and apricots adding a light sweetness that's brightened up by fresh mint. You can toast the nuts in the oven or microwave to free up some room on the stovetop, too. Freshen up your lunchtime routine with this easy and elegant salad, using pears, walnuts, and gorgonzola. Just about any lettuce you prefer works fine, and you can choose any type of pear at the market, too. Dress it with a light vinaigrette to avoid masking the flavors. Vegans can leave off the cheese or substitute dairy-free varieties. Serve it as a light lunch or a sprightly first course. 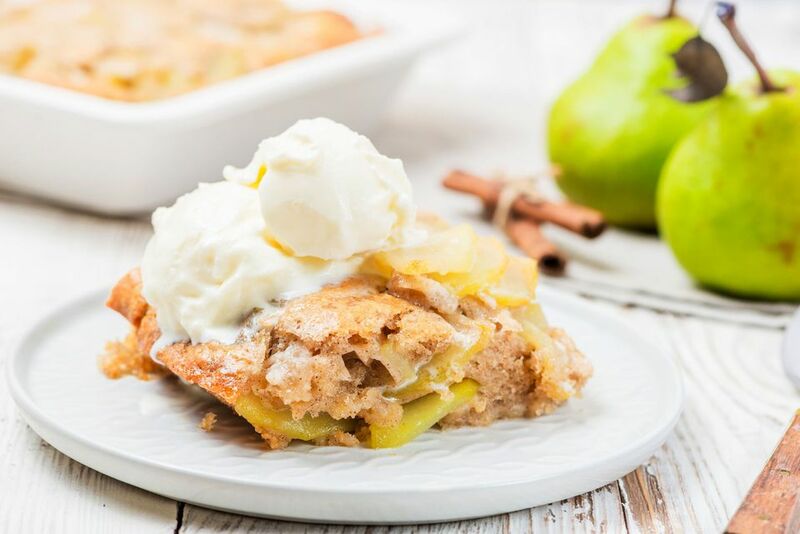 Fresh pears and a buttery, cake batter-like topping make this delightful pear cobbler an excellent choice for a fruity dessert or even a brunch side dish. Choose firm, ripe Anjou or Bosc pears for this recipe, or combine them with Bartletts for a little variety. For a pear and blueberry cobbler, just toss in a cup of fresh blueberries with the pears and sugar. Voila! Have your pears and drink them too with this bright and fizzy martini. The delicate, floral cocktail mixes together pear vodka and elderflower liqueur with a finishing topping of champagne for a festive touch. It's just as perfect for a fancy event as a relaxed Sunday brunch or even a "treat yourself" cocktail hour. Garnish it with fresh pears for extra panache. Use up extra pears and craft a delicious gift with this pear and vanilla jam. While the recipe calls for a whole vanilla bean, you can also use vanilla bean paste or vanilla sugar. Powdered pectin makes it quicker to prep. Make a big batch and save some for later. Greet the day the right way with this pear streusel coffee cake. This recipe is a variation on the classic apple version, which makes a great breakfast for overnight guests. Feel free to add chopped nuts for extra texture. Make it ahead to streamline busy mornings. Both chicken breasts and pears cook quickly, so this recipe comes together in a flash for an easy weekday dinner. Sweet pears, spicy fresh ginger, chicken broth, and savory onion drippings make a delightful sauce you'll want to soak up with pasta or rice as a side. Serve it with a green salad or a vegetable for a unique meal that will please the whole family. Impress your dinner guests or the potluck with this gorgeous upside-down cake. Fresh pears bring a wonderful sweetness and the gooey caramel layer will have everyone going back for more. Bosc or Anjou pears will hold their shape best for this lovely presentation. Bartlett or Comice pears get too mushy to create a textural contrast. If you've never paired sweet potatoes and pears, you're in for a treat with this salad. Grilling the pears and sweet potatoes brings out their natural sweetness, which contrasts nicely with sharp feta cheese and peppery arugula and spinach. You can use other lettuces if you prefer, but arugula's assertive bite balances well with the sweet pears and potatoes. We love pears and cheese together and this awesome grilled cheese showcases them in the very best way. Use a nice, hearty bread for this simple sandwich, which can be dressed up for a nice lunch or just as easily tossed in the brown bag. Funky brie plays off the sweet pears perfectly, but feel free to sub in your favorite sharp cheese instead. Pies can be intimidating, but this rustic galette takes all of the stress out of the often-fussy dessert. Using refrigerated pie crust means you can have it together in a zip. Choose your preferred frozen berry mixture and just barely ripe fresh pears for a filling that still has a little bite. Serve with sweetened whipped cream or vanilla ice cream. Those who prefer to drink our fruits and veggies will love this colorful and vitamin-packed smoothie. Red beets and pears head into the blender with a little lemon juice for tang and honey for sweetness, along with water and ice cubes. Substitute milk for the water for a creamier texture, add yogurt for thickness, or use a different sweetener if you prefer. The only limit is your own creativity! This recipe proves that pears aren't just for dessert. Pair the fruit with pork in this umami meal that will really stick to your ribs. The poached pears soak up the aromatic star anise and allspice and their subtle flavor plays nicely off equally understated pork. Serve this succulent dish with a green salad and some hearty bread to soak up that sauce. This richly flavored Italian conserve, called a savòr, makes the most of sweet pears, meaty walnuts, and whole lemons. Pectin in the lemon rinds will help it set up naturally without any additional ingredients. The finished product tastes delicious as a spread on whole-grain bread, spooned into yogurt, or even as a sauce for pork or chicken.